Fürstenfelder beer garden is located on the grounds of the historical Fürstenfeld Monastery in Fürstenfeldbruck, about 30km west of Munich centre. The beer garden is situated in the area of the former living quarters for monks and personnel. The section where the self service food stall is now located was built in 2002 in style of the old architecture. The restaurant, which is still part of the original structure, dates back to the 13th century. The current restaurant in the same premises as well as the beer garden opened in 2003. The beer garden is partly shaded by sun-umbrellas and one huge tree at the centre of the self-serviced area. The self-serviced area has 550 seats and the serviced area has 160 seats. The Fürstenfeld Monastery was founded in 1256 under the rule of “Ludwig der Strenge”, Duke of Bavaria. After having beheaded his first wife on mistaken suspicion of having had an extramarital affair he was sentenced by Pope Alexander IV to build a monastery. Perhaps partly due to his sense of guilt thereafter, he maintained and equipped the monastery favourable until his death in 1294. The beer garden with its impressive and castle-like baroque monastery backdrop has become popular amongst locals who often come in groups of friends to unwrap their home cooked food in true Bavarian style. For those who do not bring their own food, the restaurant and self service canteen offers Bavarian specialties, often using ecologically grown ingredients from the surrounding farmlands. The beer served is Paulaner and a Maß Helles (lager) costs €6,10 (April 2013). A rare Weissbier (wheat beer) served from the tap is Unertl. 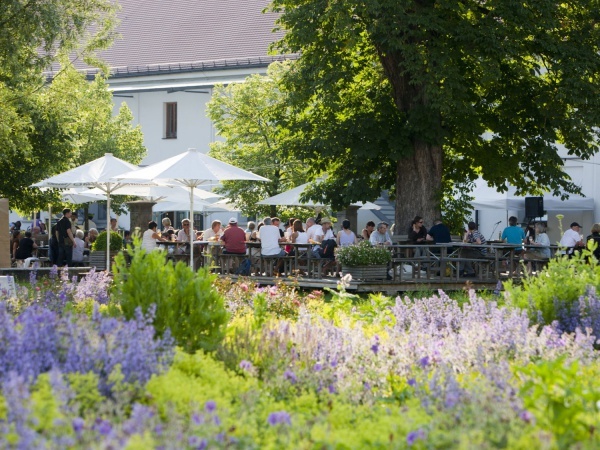 The beer garden is part of a 4-star hotel which opened in 2008, also named Fürstenfelder, situated in a separate area outside the monastery grounds. The beer garden is open on weekdays from 5pm, Saturdays from 2pm and Sundays from 11am. Closing time all days is at about 11pm. The restaurant is open seven days a week from 11.30am until 11pm.